Spot the Dot iPad app. Today's NY Times features a helpful piece from Pradnya Joshi on finding apps for people with autism. 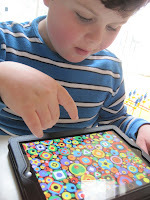 It includes a great picture of Leo, plus a link to the Apps for Autism recommendations spreadsheet I maintain with Jordan Sadler, SLP and Corina Becker. UPDATE: The link is now fixed. Hurrah! It's a good article, worth your time. And as always, I do welcome app recommendations so we can keep that spreadsheet timely and relevant. Leo + Disneyland = True Love! To Bloody Hell, and Beyond! This One Goes to Eleven!